Fundraising Seminar for Children with Cancer in Mexico City. As has been known to happen from time to time, three different high profile Aikido Shihan scheduled seminars in Mexico City in less than a four week period. In October, Fujita Shihan from Aikikai Hombu dojo, USAF’s Yamada Shihan from New York, and Kawahara Shihan from Canada all came to Mexico City to teach. 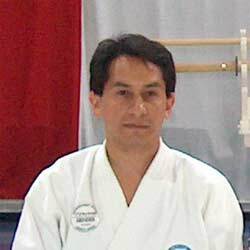 Although all are officially recognized Aikikai Shihan, each has their own completely separate dojo system in Mexico City. I guess it is a good thing that Mexico City is reportedly the largest city in the world! Unbeknownst to us, our seminar was also scheduled during this period, which made the outcome of the event even that more interesting. Students have approached me from many countries with questions about putting together seminars and about how to improve other dojo operations. It was questions like these that began our relationship with Mexico Aikido Take Musu Aiki in Mexico City, a relationship that has now begun to take Aikido in Mexico in a new direction. In the early spring and summer of 2003, Fernando Roman Sensei and his students visited Nippon Kan. They asked many questions about how Nippon Kan was operated, and asked me how much I would charge to come to Mexico to teach. I answered, “If you are looking for new ideas, and a new direction for Aikido in Mexico, I would happily volunteer to come at no charge. This is my contribution. What I believe is important is to think of ways to involve your dojo in your community, how to share what we can create with others. If you would like to use Nippon Kan’s AHAN project outlines as a guide for your dojo, I would be happy to help”. The results of that beginning conversation brought me to Mexico in July where I met other dojo members and researched the project goals, resources and facilities available to move forward. This visit ultimately culminated in the Mexico Aikido Take Musu Aiki sponsored seminar to benefit children with cancer in Mexico held this past November 7th -9th. About one hundred adult Aikidoka, thirty youth and many observers gathered at the Tecnologico de Monterrey (Technical University of Monterrey), Nov 7-9th, 2003 for a seminar unique in its makeup and purpose. I asked our Mexican hosts how this compared to the attendance at the other seminars held in October, and was told it was about the same. One thing that was unusual about this seminar however was that this seminar was organized by Mexico Aikido Take Musu Aiki dojo, which like Nippon Kan, is an independent dojo. Mexico Aikido Take Musu Aiki Dojo has been independent in Mexico City since 1998. This seminar was the first of its kind in Mexico, and even though Fernando Roman Sensei and Rocio Aguero Sensei are not part of a large structured dojo hierarchy, they attracted many Aikidoka to join us for the event. There were no examinations given at this seminar, so that was not the reason that people came. Inquiring, I learned that besides members of Mexico Aikido Take Musu Aiki dojo, instructors and students from eight different dojos had come from many different parts of Mexico to attend the event. A number of students were scheduled to attend from Columbia, South America, but could not overcome obstacles in obtaining visas to Mexico. As I looked around at students at the seminar I could see many different logos and patches on student’s uniforms and it began to dawn on me that this was a unique event for Mexico Aikidoists in more ways than one. I am very proud and honored that so many different Aikidoka came to the seminar, but I thought,” Compared to the very well known Shihan who had come to Mexico to teach this past month, my presence is like comparing “first class to coach”, and I am not the one with the ample leg room!”. The seminar fees were comparable, so it was not the price. I reflected on all of the seminars Nippon Kan and AHAN have been a part of in the last few years to see if I could define what might have made these seminars successful. If I could outline a “formula” it might be a way to help other dojos, especially independent dojos improve their own operations. In most cases, students of Aikido who have gone on to make Aikido a way of life have absolutely no idea that this would be their future when they began. First a student, and then an instructor, the progression is a natural one. All of a sudden there is a new dojo. NOW there is rent, utilities, telephone and insurance bills that have to be paid every month! Things have suddenly changed a great deal. There is worry over how many students are attending and how to appease and comply with the pressures from parent organizations. There are rules to follow, forms to fill out, and contracts to sign. All of a sudden one is spending all of one’s time on business and marketing instead of teaching and practice. Making ends meet has suddenly taken priority over perfecting forward rolls. Concentrating only on the business administration doesn’t keep a dojo going either, and it sometimes takes a long time to understand that balance. Realistically, the few who have made a true business success out of a dojo are rare indeed. Most of the successful dojo owners I have met usually have another primary source of income. This allows them the flexibility to spend their time teaching instead of trying to rely on their students for their livelihood. These are the instructors in my experience who ultimately attract students and keep them. Some of these instructors are independent, and some are part of large Aikido organizations. I have heard from many instructors that dealing with the vertical linear relationship that makes up the structure of large Aikido organizations have ultimately had unfortunate consequences. Many students or instructors have left these large organizations over financial or achievement and service recognition issues but that is an issue for another article another day! I want to focus on how to get out of this track and return to the mind and heart we all had when we began our practice of Aikido. I want to focus on the possibilities that are out there if you release yourself from focusing on these types of problems. I have been down this road for most of my life, and I would like to share some of what I have discovered. Nippon Kan began as an independent organization. It did not break from another organization to become independent. There is a difference. I was not like other Japanese Aikido Instructors who came to the United States on a mission to build empires; teaching Aikido actually, was not my first dream. Never in my wildest dreams, could I have imagined that Nippon Kan would become what it has become today. When I first came to the United States twenty seven years ago, I did not belong to any organization, and have not joined any organization since that time. For a long time Nippon Kan has been labeled as kind of a “maverick” dojo. Being independent means not having an organization to answer to. It means not having restrictions, rules and payments due that may cause stress and worry. It also means feeling very alone at times. 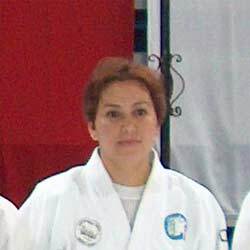 Without the restrictions of a parent organization, Nippon Kan has been free to create and develop some very unique ideas about dojo operations. When Nippon Kan began, we were barely was able to make ends meet. Today Nippon Kan supports humanitarian Aikido projects all over the globe. Coming to the United States was an inspiration for me in one way. It taught me to be independent. Without an organization or a teacher, I learned to support myself. I had no language skills and no foundation capitol. I was rich in one way however, I had the support of good students. And it turned out to be that it was this support which was the reason for my survival. For over at least ten years I had a very hard life. I had even learned at one point to live on rice, eggs and grasses I gathered by the riverside. Slowly however Nippon Kan stabilized and life became a little better. At that point I felt I needed to show my appreciation to all of my students and friends who had helped me make it this far. Not knowing how to thank every individual personally, I chose to show my appreciation through my actions instead of my words. I started serving meals to the homeless at the Denver Rescue Mission. At first I went alone. The money I needed to make the dinners I served was about the same amount I needed for the telephone and electric bill. This was not easy to do, and was a struggle month after month. About two years after I had begun serving meals at the mission, an article was written about my service in the local Denver papers. I was busted…everyone suddenly knew what I had been doing. After that time, my life changed. Like ice melting in early spring it changed slowly, but positively. Students were excited about the volunteer service and wanted to help. Word spread about Nippon Kan student activities and more students came. Nippon Kan began to grow. Today it continues to grow, and AHAN has become international with projects in Mongolia, South America, Mexico and Eastern Europe. Expressing my appreciation for the good will and support of my students has blossomed into something much bigger than the parts it is made of. A positive circulation and momentum had begun. “Muhoshu no Mugendaihoshu”, or “Benefit for no one individual leads to unlimited benefit for all” is a Japanese saying that expresses how I feel about what has happened at Nippon Kan. I now want to help other small, isolated, independent dojos that might need a hand in figuring out how to make their dojo successful. There are many very nice Aikidoka in the world that are just inexperienced in managing a dojo. These are the people I would like to reach with words of encouragement. If you get stuck focusing on dojo finances and politics your dojo will have trouble surviving. There is a better direction in switching tracks. To switch tracks, start by doing something for your community. This action helps to release you from these negative worries. It also begins a positive direction to guide your students, and for attracting new members to your dojo from the community you are serving. Take off the ceiling and the walls of your dojo and relate to your community on an equal level; not vertical like the hierarchies that dominate our Aikido culture today. If you do this, you will receive things that money cannot buy. Success and happiness are not in the same track as the worries left behind. There is a simple solution in changing direction. Simply, appreciate your students and show your appreciation for them with actions, not just words. Show your appreciation with actions that give back to your community. Within these actions, happiness will be brought back to you. My first advice about seminars is to let go of the idea that any seminar is going to make you a lot of money. This attitude dampens the spirit, and narrows the focus and benefits possible. If you do have extra money from the event, my advice is to find a way to return a portion of it back to your community. I know that this is a new concept, and a big change in purpose, but the benefits of this approach are multifold. There is a Japanese poem I am particularly fond of. “Zenomotte okonau mono wa, fukuo motte ten ga tasukeru”. This translates in English as “If your intentions are good and your actions help others, then the heavens will bring happiness back to you”. The people of Mexico are traditionally a kind hearted people of deep faith, and Fernando heard this poem with his heart. He and his wife Rocio chose a project as a focus for the seminar that was special to them. It was the Casa de la Amistad, a facility which houses and cares for children with cancer and their families. I respected them for their perception and understanding and we moved to solidify the plans for the upcoming event. This was a project that Nippon Kan’s AHAN (The Aikido Humanitarian Active Network) would be happy to support. The seminar was held at the very exclusive private Tecnologico de Monterrey University in a double basketball court gymnasium with observation seating. The mat space was large and well laid out, and there was ample room for practicing bokken and jo. Our hosts had set up an organized registration area, baggage check, medical station, and a display for books and souvenirs. The front of gymnasium was beautifully decorated with red and white draping, flowers, photos, and banners. I was very proud when I realized that much of the organization had come from observing Nippon Kan seminar set-up, right down to the red ribbon arm bands worn by the medical staff while they were practicing! The opening ceremony was attended by guests from the University administration, and staff members of the Casa de la Amistad. Each gave opening speeches of welcome in Spanish, of course, which were translated by our own Jorge Gibbons who had traveled with us for that purpose. The opening speeches were followed by ceremonial Mexican dances performed by children and young adults in traditional costume. The dancing lightened the mood for the seminar, and everyone seemed ready to begin. The three day seminar was divided into eight one to two hour classes, each with their own theme and focus of study. All attending students and instructors listened and studied carefully. The seminar closing was attended by children in treatment from the Casa de la Amistad, accompanied by the center’s Founder, Dr. Tanaka and his wife Yoko-san. As part of the closing ceremony, our hosts Fernando Roman Sensei and Rocio Aguelo Sensei donated funds, foods and other supplies and Nippon Kan AHAN also made a monetary contribution. This donation included funding support by Aikido Journal’s Chief Editor, Mr. Stanley Pranin. Mr. Pranin as well understood the value of this seminar and offered not only monetary support but also letters of endorsement and support for the seminar’s advertising campaign. The facility resonated with the thunder of applause by students, family members and friends who were all there to share in this accomplishment. There was a show of smiles, as everyone stood for an extra standing ovation. It was at this moment that our hosts, the organizers of the event, all attending students, observers, the children and supervisors from the cancer facility all shared in what is easier for me to express in Japanese, “Muhoshu no Mugendaihoshu”, or “Benefit for no one individual leads to unlimited benefit for all”. This smile is the benefit that is best of all. As any independent instructor soon comes to realize, taking care of Mexico Aikido Take Musu Aiki has been a lot of hard work for Fernando Roman Sensei and Rocio Aguero Sensei. I am honored and appreciative that they have listened to my humble advice and organized a pioneer event for Aikido in Mexico. 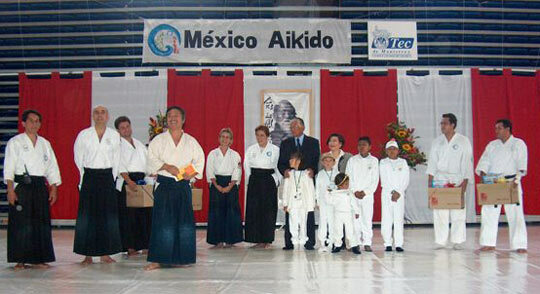 This has been the first fundraising Aikido seminar in Mexico to benefit others in the community. You need to have a strong spirit to be a pioneer and lead the way where no one else has gone before. Instructors that have been teaching techniques for decades have not accomplished this. The inspiration that this activity has created and will create in others cannot be easily measured. The reputation and image of our Aikido community as a whole has been raised by this event. This seminar has created happiness for many and the benefit is for all Mexico Aikidoka to share. I believe that activities such as these are the realization in this century of the Aikido of the Founder, Morihei Ueshiba. This is the new direction that I see for the Aikido community, a direction that is being led by these new pioneers. I want to thank Mexico Aikido Take Musu Aiki dojo members Senior Jose (Pepe) and Wimmer for donating so much of their time and patience to this project. I also wish to thank the University staff for their assistance and the staff of the Casa de la Amistad for their kindness. We hope that next year we will be able to offer even more support. In the past few years there has been a quite but important change taking place in our Aikido world. More and more evident is that fact that the first generations of Japanese instructors, both in Japan and also those who made their way into the world outside of Japan to teach Aikido, are now getting older. Most now are in their sixties or seventies, and a few have even passed away. Not only instructors from Japan, many native instructors in the United States and other countries are also beginning to grow old or pass on. The passing into new generations cannot be held at bay much longer. As these changes take place naturally, it is time to think about this new direction for Aikido. One Japanese poem speaks to the heart of this matter. “Zenomotte okonau mono wa, fukuo motte ten ga tasukeru”. “If your intentions are good and your actions help others, then the heavens will bring happiness back to you”. Do not get attached to style or affiliation, it is a new direction we need to think more about for our future. My wish is to share with everyone “Muhoshu no Mugendaihoshu”, “Benefit for no one individual leads to unlimited benefit for all”. Please join us in this direction in your own dojo and your own community where ever you are in this world. In closing I would also like to thank Emily Busch, AHAN President, Rick Thompson, Nippon Kan Instructor, Spanish language translator, Jorge Gibbons, and all of those who came from Nippon Kan in Denver as ambassadors to Mexico.